The body creating the person | Create! “I’ve heard this is an incredibly painful disease–is that true?” It’s funny the things people ask you when you’re lying in an ER bed, heart monitor wires crawling out from beneath a hastily thrown-on hospital gown, fluids and a steamrolling steroid drip being fed into weak veins, a second IV line put in right after the first, and a blood transfusion bracelet “just in case.” Who said this to me? I think it was the woman from registration, a process I bypassed. When I was hospitalized earlier in the summer, somewhere in those 10 days I decided to move back home to Pittsburgh for exactly this reason, this particular scenario playing out differently in its criticalness, but affirming that I had the correct logic: I’m not getting better. I’m probably not going to get “better.” I can’t do this again in New York. I can’t do this without being able to hold mom’s hand. I know I’m going to have to do this again. There I was, doing this again. But in Pittsburgh. It has been…I don’t know…a hell of a summer? Arriving here in a feeble state, physically and mentally, I threw myself into everything Pittsburgh had to offer, writing down lists of restaurants to patronize and actually going to many, joining the Steel Town Etsy Street Team and Pittsburgh Craft Collective, subscribing to area magazines I could potentially write for. Absorbing. Relying on a reserve of energy I didn’t have. Going forward instead armed with “mind over matter,” ignoring the quotidian pain, fatigue and unpleasantness because not one day is “good,” not one night slept through without marching off to the bathroom at least once or being jolted awake by insomnia. You have to think it’s all “normal,” otherwise it would become impossible to face. For everyone, but most importantly for me, it’s a lie, it’s a show, it’s trickery and it’s absolutely necessary if I don’t want to spend the day crying in bed. But when I look at what I’ve done, where I’ve been to in Pittsburgh, what I’ve seen, what I’ve created, it’s almost irritating to think about. That so much good could be interspersed with so much bad, that I had to experience all of these wonderful things while encapsulated in this sick little body. The ill person who turns illness into story transforms fate into experience. Ill people have to learn to think differently. One of our most difficult duties as human beings is to listen to the voices of those who suffer. These voices bespeak conditions of embodiment that most of us would rather forget our own vulnerability to. What is harder to hear in the story is the body creating the person. Chronic illness in particular challenges us to ask if it it possible to be successfully ill. A good story is the measure of an ill person’s success. Modernity has a hard time accepting, even provisionally, that life sometimes is horrible. I would never have chosen to be taught this way but I like the changes in me. Quest stories meet suffering head on, they accept illness and seek to use it. Something is to be gained through the experience. I agree! And I want a quest story as opposed to the alternative, the chaos narrative. I want to meet it all head on and face it and use it. I want to somehow be at peace with the fact that illness has changed me to the core, taking away my spontaneity, taking away my favorite foods, taking away my teaching career. It has made me say “no, I don’t like that” where I used to say, “yes, I do like that.” The hospital is the ultimate experiencing of that. All decisions are made for me, by my icky body and by medical professionals. I have no choices except choosing menu items when I’m allowed to eat again. Everything is done to me, the body creating the person. A person I do not want to be. But it has given me other things, hasn’t it? I would never have chosen to be taught this way… On the other hand, I just want permission to give up because I don’t see how I could ever be at peace with such losses. I bounce back and forth between these two extremes, the energizing feel of optimism, the pummeled feel of defeat. In August, I could feel the tolerably bad state of my health becoming less tolerable. But I was still arduously getting medical paperwork and tests done before starting new treatment options, in a state of limbo that I feared would lead to the hospital on a daily basis. A ticking time bomb. I always think I have reached my pain threshold, that my body cannot possibly survive this, that it can’t possibly get worse. But then it does. Then it did. I must have run to the bathroom 20 times in a few hours, a gruesome experience I am no stranger to. So much pain that reverberates throughout my entire body, my joints and muscles…screaming? I throw up a ton of water, getting dizzy, seeing stars when I try to get up, my legs buckling. Mom, something is really wrong. I can’t walk anymore, I can barely stand up. Parents hunched over me, I lie there on the floor, screaming and crying: Everything hurts. I can’t breathe. I can’t breathe! I am terrified but I am so blitzed out and incoherent from body meltdown and debilitating pain at this point that I cannot think about the option of going to the hospital. I have no concept of “a hospital,” my mind is going. I want to take a hot bath, still holding onto the possibility that I can get through this. But I can’t stand up long enough, can’t lift my legs enough to get in. It’s over. I am in low blood pressure danger zone from severe disease activity and dehydration. I am fading and I can feel it, even though I can’t think it. I actually feel a dark cloud behind my eyes, something enshrouding me. Mom, I’m gonna black out. My dad practically carries me to the car. Mom, do you know what to say when I get there? Because by the time we get there…tell me my symptoms, what has been happening. She goes down the list. I look out the window and don’t understand what any of this is. When we get to the emergency room, all I want to do is lie down on the floor. I sit in a chair but I can’t hold my head up. I am eventually put in a wheelchair, where I kind of just slump over. At first there is no blood pressure reading. And then a really low one. A patient ahead of me gets kicked out. Allergies? Morphine. And hyacinth bulbs. I never say the latter because it’s irrelevant in a hospital setting, but later when I can think again, it makes me laugh inside, this stark contrast between these two things. It would make a good name for a poem. “Morphine and Hyacinth Bulbs.” So much blood-taking. I’m gonna black out. Take deep breaths. You’re gonna drink this and it’s gonna taste like this and it may make you nauseous. A CAT scan cocktail. Being wheeled around on a bed, the proverbial you’re-too-young-to-be-this-sick comment. Every time. I lose myself in television instead, in Hart Crane poetry and Sylvia Plath journals if I can stay awake. I write only three sentences while in the hospital: Can a spirit be chipped away at? If so, mine is. Goal is one day to be able to pick up pieces and either put them back together or make something new with them. I balled my eyes out for hours and hours when I find out that the biologic treatments via injections I have to undergo indefinitely upon getting discharged will not be covered by insurance and they cost an arm and a leg. Parents aggressively begin get-patient-assistance process as I bury myself in pillows, crying until my eyes are swollen shut and I can’t breathe. I look at my computer for the first time in days and notice that the Halloween craft book I co-edited/contributed to is “in stock” instead of in “pre-order” mode. I curse, remembering that all summer I said to myself, “I was in the hospital when I became a contest semi-finalist. I do not want to be in a goddamn hospital when the book comes out.” No no no! Not when I should be writing my author profile and contacting magazines and planning bookstore events and yarn shop classes. Instead of watching strands of yarn being manipulated by my hands I am watching burning liquids being sucked into them. I look at the cover of the book, my red glittery Dorothy shoes, my little feet. There’s no place like home. Of course this is happening. Of course I am in the hospital when the book comes out. And the one outstanding Etsy order I had to cancel? A peach. Of course. When I got home from the hospital on day 7, I promised myself that I would finally design my crochet colon, one afflicted with ulcerative colitis of course, red bands encircling tissue, a frown, the title of which would be the arbitrary but official medical diagnosis code that will forever be stamped on my medical documents. 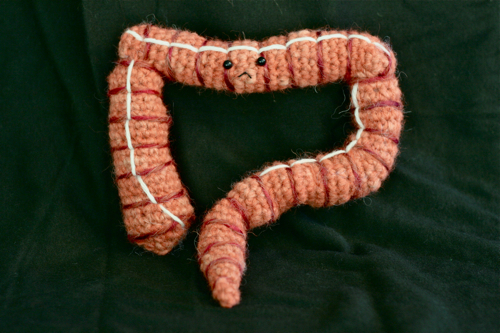 Crocheted, personified ulcerative colitis. It simplifies (too much?) the last 5+ years: girl gets disease, girl picks up crochet, girl’s life changes significantly on account of both. But what could possibly represent the experience of waking up every single day and feeling either a little bit sick, a lot sick, or somewhere in between? How many crocheted colons would I have to make to express the amount of cramps and joint achiness and heart palpitations and unpleasantness and migraines and blood loss and embarrassment and muscle atrophy and side effects and loss of dignity and vitamin deficiency and tears and raging insomnia? How many to represent that I have slept 2-4 hours of choppy sleep a night for over a month now, that I haven’t been able to eat breakfast in the kitchen because it is too far from the bathroom, that I often have heartburn that lasts all day, that I wait to cry until I’m in the shower because it feels less like I’m crying in there, that it took me over a week to be able to walk up one flight of stairs without stopping? Not enough. But making just this one, that I will put in the Plush You! show in Seattle this fall is enough, I guess. A city I first got to visit because I got sick, I crocheted, I wrote. An artistic representation of a diagnosis that has brought so much good and so much bad to my life. Is it an incredibly painful disease? It is. Is it possible to be successfully ill? I hope so. There are no words that can fully express the admiration I have for you, Alicia. You are truly a strong, amazing, and talented woman. well, hell. I was afraid of that. I’m sorry. I am so sorry to hear that you have been so ill. I am a new member of the PCC, so we have never met, but I feel very badly for you. I have had chronic pancreatitis for the past 9 years and have spent about 575 days in the hospital during that time, so I understand all the pain, illness, indignity, frustration, despair, and everything else that goes with it. All I can say is that you are a very strong person. You will make it through this. There will be good days and not so good days, but you will learn to make it through. Lean on your friends and family and keep your sense of humor. I’m not trying to push any certain doctor on you, but, after making the rounds in Pgh, I have found that the best GI doctors are at the Digestive Disorders Clinic at UPMC Presby in Oakland, so you may want to try them. Feel free to email me at any time. Take care of yourself. I had sympathy pains reading of your illness and felt compelled to mention a program that may help. It’s call Great Taste/No Pain. I’ve ordered it myself because of a nasty case of reflux acid disease. It takes a lot of discipline to combine foods correctly, which is a problem I have. I love my meat and potatos! The gal that does my hair has ulcerative colitis and she’s the one who introduced the program to me. She is a young mother and swears by this program. You can google it. I hope you find some pain free healthy days ahead of you! AND I have to say I just love your crochet talent and appreciate the free patterns. I stumbled upon your post from the CRAFT blog and I just wanted to let you know that I have had crohn’s disease for 15 some years and while it seems grim now it really does get easier. I made a colon woodcut for my doctor when I was first diagnosed too… hang in there. I may have the beginning stages of Chron’s, or some other fun form of UC. There weren’t any signs of anything (every single test came back negative so I stopped going to the doctor. I can’t afford it) but the symptoms all match up. This is what I’m so desperately afraid of. Now that things are back in the balance, I’m eating all the corn I can before I can’t anymore. I like your cute crafts and especially the UC/Crohn’s-related ones, as my husband has had a similar road as you, though sans-colon. His biologics are now covered by insurance, and if you want to email me, i can give you some more information about how we got that to happen (though perhaps you’ve tried everything, already… it’s an option, which is something i can see you feel are often in short supply!). Good luck in crafting and health! @Cassie Hi there! Thank you! Luckily, we are now getting it all covered through Abbott, which has a patient assistance programs for the financially struggling. Is this what he has used? So, I *just* started on Humira last week and I, knock on wood, feel a TON better already. Thank you so much for reaching out. @laura 2, ugh I’m sorry…I’m always surprised when they can’t diagnose right away but I have heard of that happening. There’s always IBS too…less easy to diagnose that. Does it seem to come and go? Can you tell what brings you back into balance? Oh corn I have missed corn! @Kris, I will look into that, thank you! When I’m healthy-ish, I become more aware of my food sensitivities, but sometimes it seems so random. One day, this is okay, another day it’s not. Mysterious body. Enjoy the crochet patterns!!! @Robin W., hello! And thank you for your comment. I am a relatively new PCC member too (June). Wow, that is some serious hospital time–I am sorry. I have heard of pancreatitis and I know it’s no picnic. Yes, it’s all about the support network and trying to laugh/smile when possible. Thanks for the doc rec. I see Dr. Mlecko in Wexford, as my uncles, PCP and him are all at Passavant Hospital, so it makes it “easier.” I live in the city though…. I hope to meet you in person soon!!! http://www.dirt-girl.com/gallery/OldWork/UlcerativeColitis-9-b.jpg I take humira too it’s been awesome and they will help you pay for it. I wish it had been around when I first got sick. Thanks for an amazing post. @Ali, I’m glad I could articulate it!!! Thank you so much for your comment. I appreciate the link too, as I hadn’t really ever looked at any UC blogs, strangely enough (and your blogroll!). Wow, to be pregnant with this…I cannot even imagine! What are you taking right now? You have pics of your crafts anywhere? @Jessie, yes, this Humira stuff is crazy!!! In a good way. And yes, the $$$ is key. Love the woodcut!!! Have you made any more? @Jessie, who does the sand painting? No. Temporarily his dr. was providing it, as we were only able to get it covered through a lengthy (but successful!) appeals process we were able to get insurance to cover it. We’ve since switched insurance companies and now have to process to look forward to again, but regardless we’ll do it. The medication (same as yours) has literally given his life back. He was previously diagnosed with UC (during which time he had a full colectomy). It was only after his disease was redefined as Crohn’s that he was prescribed Himira. I’m glad to hear that the medication is working for, and available to UC patients, as well! You will pull thru….it won’t be easy, it won’t be painless, it won’t be fast, but you will do it. I have suffered with Crohn’s Disease since 1979 altho the doc figures I could have had it longer. Longest hospital time was 6 weeks when I was only 3 months pregnant & where I nearly died, along with my baby….8 blood transfusions, TPN, a very intimate relationship with the bathroom…the usual…thankfully the steroids (Prednisone) helped to strengthen my child’s lungs, as he was born 9 weeks early, only weighing 3.14 lbs but thankfully healthy as could be. I did have surgery, had a little over 1 metre of small intestine removed & now must take Vitamin B12 for the rest of my life, because the part of my intestine that would normally absorb it, is now gone…a small price I feel. Hopefully, your Colitis will improve as you age, as the Crohn’s has (so far!) with me. I wish you nothing but good health & happiness on your life’s journey….may serenity be yours.